Cardi B and 8 Other Adorable Celebrity Pregnancy Reveals! HUGE congratulations are in order to Cardi B and Offset following Cardi’s big pregnancy reveal on "SNL" this past weekend! The groundbreaking rapper debuted her new album AND her baby bump while performing her song “Be Careful” as her last performance of the night. The move was made with a stunning white gown proudly showing off the soon-to-be newest addition to the family. Following Cardi’s announcement, let’s take a look back at some of the other cute and fun celebrity pregnancy reveals! Back in 2011, Fey made an appearance on the legendary "Oprah Winfrey Show" where she was set to promote her autobiography Bossypants. It was clear when Fey was seated that she was rocking a baby bump, and the confirmation came when Oprah asked, “It’s real?” followed by Fey excitedly saying, “It’s really happening!” At the time, Fey was five months along, and she and husband Jeff Richmond welcomed their second daughter, Penelope Athena Richmond, on August 10, 2011. #TBT to the famous Ice Bucket Challenge! Scottish television host Dawn O’Porter and her husband, Irish actor Chris O’Dowd, announced their pregnancy in a completely on-trend (at the time) fashion. After O’Dowd received his bucketful of icy water, he nominated “baby O’Porter”, turning the camera to his wife. She then poured a tiny cup of water on her own baby belly! Such a cute way to break the news! Conrad announced her firstborn’s arrival through a classic Instagram post. The post is a print-out of the ultrasound picture where you can just make out her son’s head and body. 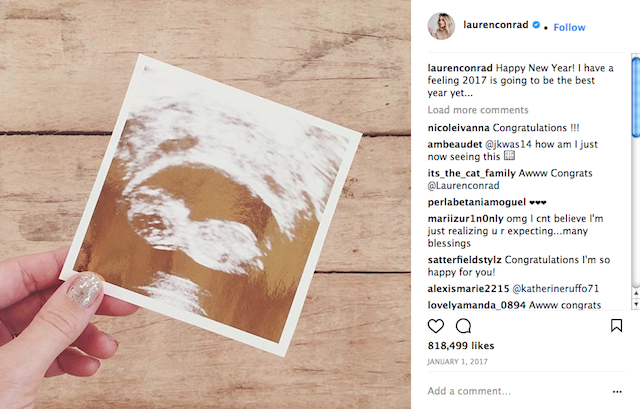 With the picture being shared on New Years Day 2017, Conrad said in the caption that the year was “going to be the best year yet…” She and husband William Tell welcomed little William “Liam” James Tell on July 5, 2017. During a concert in late 2012, West shocked fans (and Kim herself!) by stopping the music during a performance to announce “Can we make some noise for my baby mama?” As the fans cheered, West couldn’t keep the huge smile off his face as he finally shared the news. At the time, Kim was three months pregnant and confirmed the news a few days after the concert on her blog. The couple welcomed their firstborn, North West, on June 15, 2013. The singer definitely wins cutest announcement! 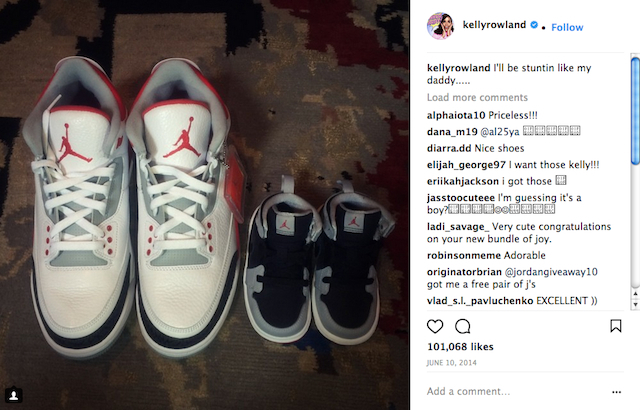 In 2014, Rowland posted a picture of husband Tim Weatherspoon’s adult Jordan sneakers next to a pair of tiny ones with the caption “I’ll be stuntin like my daddy.” So adorable! In addition to sharing the initial pregnancy news, Rowland made a little mistake by dropping the baby’s gender publicly. In an interview with FOX411 a month after the post, she slipped up by using the baby’s pronouns when talking about buying things for him. When she realized her mistake, all she could do was laugh it off, “It, it’s…aw, f--k it! It’s a boy. It’s a boy!” Classic Kelly. The couple welcomed their baby boy Titan Jewell Weatherspoon on November 4, 2014. Biel and Timberlake went the Instagram route as well with a simple shot of the proud dad-to-be kissing her belly. 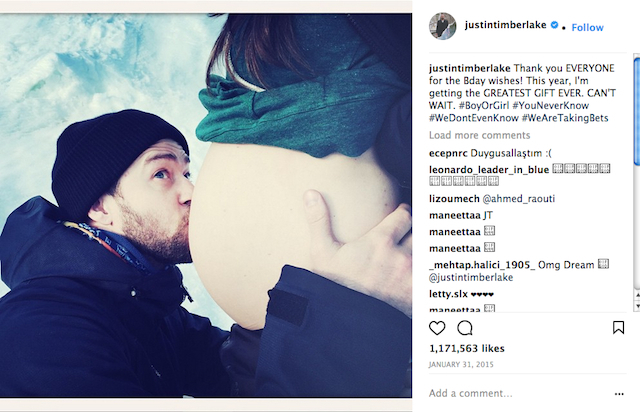 The announcement came on Timberlake’s birthday with him calling their child the “GREATEST GIFT EVER.” The couple welcomed baby boy Silas in April of that year. In what was one of the biggest celebrity news moments of the year, Kylie Jenner’s birth announcement made crazy headlines! After heavy speculation for months about whether the star was pregnant, she confirmed the rumors with an emotional Instagram post apologizing for leaving fans in the dark. She followed up with a very heartfelt video that documented her entire 9-month journey with boyfriend Travis Scott. If you say you made it through that video without at least tearing up, I don’t believe you. Baby girl Stormi Webster was born February 1, 2018, and records with the first picture of her on Jenner’s Instagram becoming the most liked picture of all-time! Rounding out our best-of list is Queen Bey herself! The star singer revealed the pregnancy of daughter Blue Ivy at the 2011 MTV Video Music Awards by ending her performance of “Love On Top” by showing off her baby bump. The fact that she pulled off those flawless moves and vocals and then casually revealed her pregnancy still shocks me to this day! The power couple welcomed Blue Ivy the following year on January 7. Also, let’s not forget the iconic reveal of the twins, Rumi and Sir, through Bey’s Instagram post. The picture quickly became the most liked picture of the year and was only recently edged out by Jenner’s own reveal post.